Telex is a next generation Internet freedom technology. It's designed to help citizens of repressive governments freely access the online services and information of their choice. 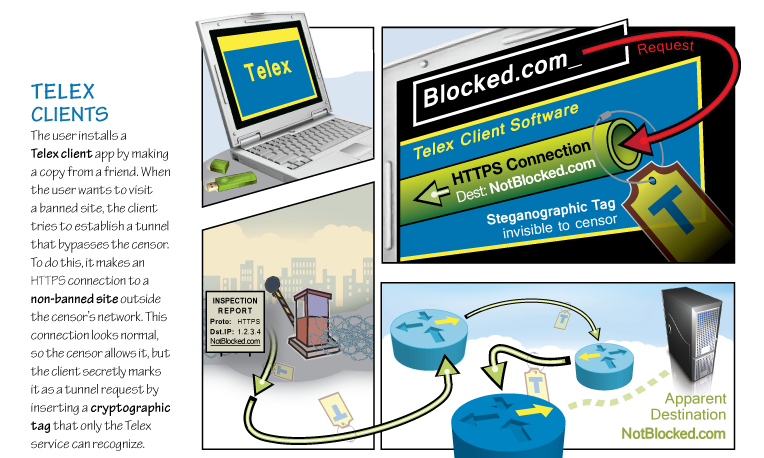 The Telex approach differs from other tools available today: Rather than working at network endpoints, Telex works through Internet service providers and other operators of core Internet infrastructure, which helps make it very difficult to detect and block. Telex has evolved into Refraction Networking, which is now deployed at ISP scale. 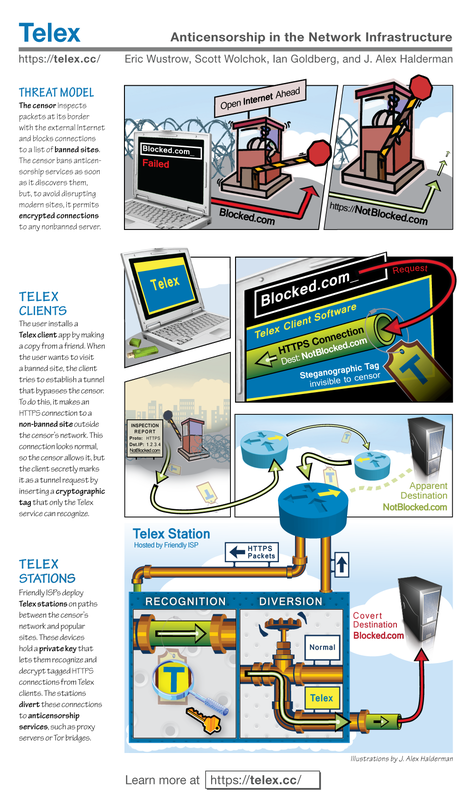 Telex operates in the network infrastructure — at any ISP between the censor's network and non-blocked portions of the Internet — rather than at network end points. This approach, which we call “end-to-middle” proxying, can make the system robust against countermeasures (such as blocking) by the censor. Telex focuses on avoiding detection by the censor. That is, it allows a user to circumvent a censor without alerting the censor to the act of circumvention. It complements services like Tor (which focus on hiding with whom the user is attempting to communicate instead of that that the user is attempting to have an anonymous conversation) rather than replacing them. Telex employs a form of deep-packet inspection — a technology sometimes used to censor communication — and repurposes it to circumvent censorship. Other systems require distributing secrets, such as encryption keys or IP addresses, to individual users. If the censor discovers these secrets, it can block the system. With Telex, there are no secrets that need to be communicated to users in advance, only the publicly available client software. Telex can provide a state-level response to state-level censorship. We envision that friendly countries would create incentives for ISPs to deploy Telex. Government Internet censors generally use firewalls in their network to block traffic bound for certain destinations, or containing particular content. For Telex, we assume that the censor government desires generally to allow Internet access (for economic or political reasons) while still preventing access to specifically blacklisted content and sites. That means Telex doesn't help in cases where a government pulls the plug on the Internet entirely. We further assume that the censor allows access to at least some secure HTTPS websites. This is a safe assumption, since blocking all HTTPS traffic would cut off practically every site that uses password logins. The client secretly marks the connection as a Telex request by inserting a cryptographic tag into the headers. We construct this tag using a mechanism called public-key steganography.This means anyone can tag a connection using only publicly available information, but only the Telex service (using a private key) can recognize that a connection has been tagged. Telex doesn't require active participation from the censored websites, or from the noncensored sites that serve as the apparent connection destinations. However, it does rely on ISPs to deploy Telex stations on network paths between the censor's network and many popular Internet destinations. Widespread ISP deployment might require incentives from governments. At this point, Telex is a concept rather than a production system. It's far from ready for real users, but we have developed proof-of-concept software for researchers to experiment with. So far, there's only one Telex station, on a mock ISP that we're operating in our lab. Nevertheless, we have been using Telex for our daily web browsing for the past four months, and we're pleased with the performance and stability. We've even tested it using a client in Beijing and streamed HD YouTube videos, in spite of YouTube being censored there. Telex illustrates how it is possible to shift the balance of power in the censorship arms race, by thinking big about the problem. We hope our work will inspire discussion and further research about the future of anticensorship technology. For more information, see our questions and answers section, read our technical paper, or contact us.